Obesity is associated with numerous and significant health problems; this also applies to childhood and adolescent obesity. 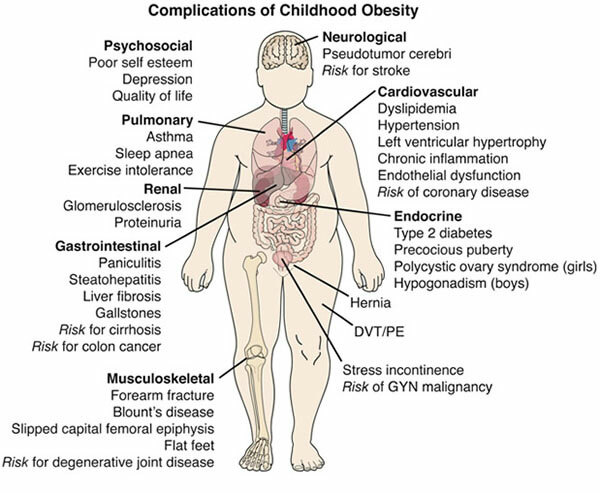 Childhood and adolescent obesity has been associated with a number of significant health problems. This condition significantly increases the risk of hypertension, hypercholesterolemia, hypertriglyceridemia, hyperinsulinemia, and atherosclerosis. Type 2 diabetes mellitus is also becoming more prevalent in adolescents, especially among obese adolescence.The incidence of Type 2 diabetes in children has grown ten fold over recent decades where one third of toddlers are expected to be affected by this condition at some point in their lives. Metabolic syndrome also becomes a concern as 33-50% of obese adolescents have been identified as having metabolic syndrome. Obstructive sleep apnea syndrome occurs more frequently in obese children and has serious adverse effects on daytime learning and quality of life. More than 50% of all teens seeking bariatric surgery have this condition. Obese children also are at increased risk of pseudotumor cerebri, skeletal complications, and polycystic ovary syndrome. Risk of gynecologic and gastrointestinal malignancies also has been closely linked to obesity, specifically to BMI during the teen years. Non-alcoholic steatohepatitis also occurs in obese youth and may eventually prove to be an important cause of end-stage liver disease for young adults who were obese children. Obese adolescents are more stigmatized by peers and cite fewer friendships when compared to adolescents without a weight problem. Obesity young adults is associated with higher high school dropout rates, lower rates of satisfaction with life, and lower rates of marriage and later family income.